Click image to enlarge Phoca Rock as seen from Bridal Veil Overlook, Oregon. Image taken October 10, 2004. Phoca Rock lies along the Washington shore of the Columbia River at River Mile (RM) 132, just offshore from large basalt feature of Cape Horn and Cape Horn Landing. 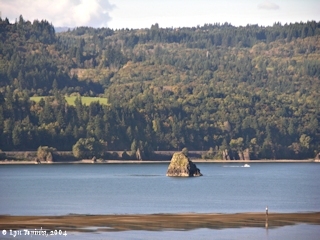 Across the Columbia on the Oregon side is Dalton Point. Phoca Rock is a landslide remnant, the result of undercutting of the Columbia's southern bank by the Missoula Floods. Phoca Rock was named by Lewis and Clark, after the Latin (Greek?) word for "seal", as presumably they saw many seals in the area. However in their journals for November 2, 1805, the day they passed Phoca Rock, they make no mention of spotting "seals" of any kind. 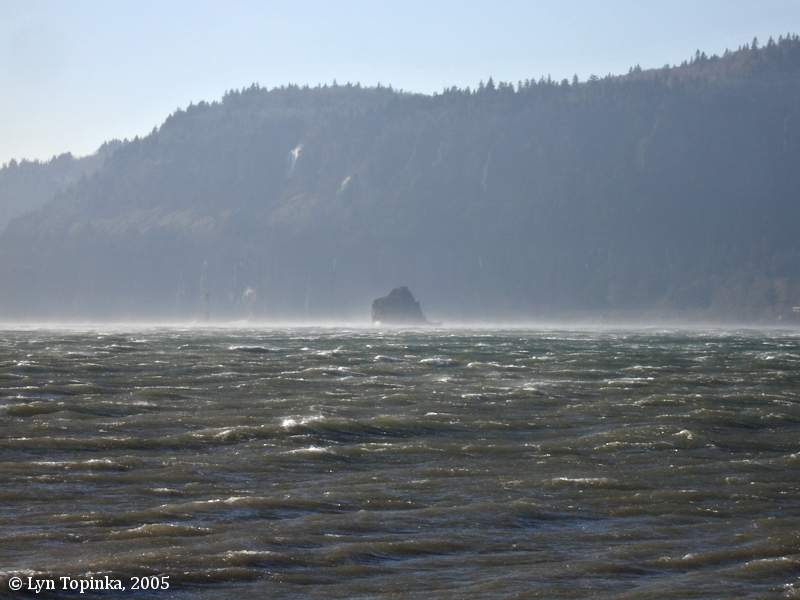 The name "Pho ca rock" does appear in their writings during the winter while in their camp at Fort Clatsop. 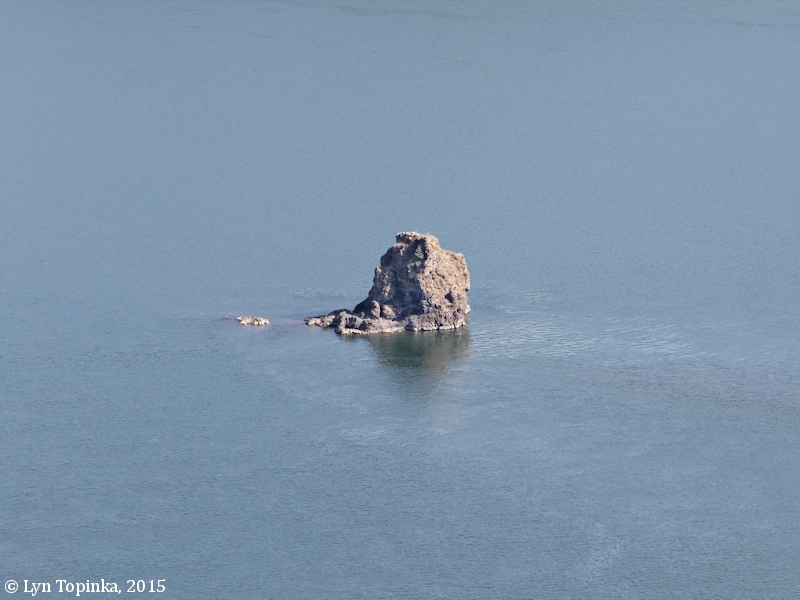 Throughout history the Phoca Rock has also been called "Lone Rock" and "Sentinel Rock". In 1841 Charles Wilkes of the U.S. Exploring Expedition called it "Hermit Islet". Click image to enlarge "Lone Rock" and Steamer, ca.1920 Penny Postcard, ca.1920, "Columbia River Showing Lone Rock Near Cape Horn, Oregon". Pacific Novelty Co., San Francisco and Los Angeles. In the private collection of Lyn Topinka. Click image to enlarge "Sentinel Rock", Columbia River, ca.1910 Penny Postcard, ca.1910, "Sentinel Rock, Columbia River.". Card #4046, Published by M. Rieder, Los Angeles. Postmarked August 1913. In the private collection of Lyn Topinka. According to Moulton, the "seal" which Lewis and Clark spotted was the Harbor Seal, "Phoca vitulina richardii". Today the Pacific Harbor Seal, California Sea Lion, and the Steller Sea Lion frequent the waters of the lower Columbia River, from its mouth at Clatsop Spit all the way up past the Bonneville Dam. "... The Seal or Phoca are found here in great numbers, and as far up the Columbia as the great Falls, above which there are none. I have reasons to believe from the information of the men that there are Several Species of the Phoca on this Coast and in the river, but what the difference is I am unable to State not haveing Seen them myself Sufficiently near for manute inspection nor obtain the different kinds to make a comparison. the Skins of Such as I have Seen are covered with a Short thick Coarse Glossy hair of a redish bey brown Colour. tho' the animal while in the water, or as we saw them frequently in the river appear to be black and Spoted with white sometimes. I am not much acquainted with the Seal, but Suppose that they are the Same common also to the atlantic Ocian in the Same parrelal of Latitude. the Skins, or those which I have Seen are presisely Such as trunks are frequently Covered with. the flesh of this animal is highly prised by the nativs who Swinge the hair off and then roste the flesh on Sticks before the fire. 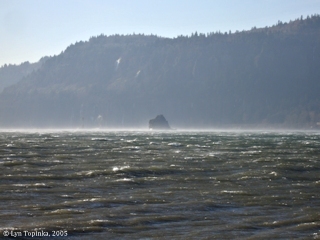 ..."
Click image to enlarge Windy Weather, Phoca Rock, as seen from Dalton Point, Oregon. According to the evening news, winds were sustaining at 30-40 with gusts of 60-70. Image taken December 10, 2005. Click image to enlarge Phoca Rock ("Lone Rock") and Steamer, ca.1920 Penny Postcard, ca.1920, "Columbia River Showing Lone Rock Near Cape Horn, Oregon". Pacific Novelty Co., San Francisco and Los Angeles. In the private collection of Lyn Topinka. Click image to enlarge Phoca Rock ("Sentinel Rock"), ca.1910 Penny Postcard, ca.1910, "Sentinel Rock, Columbia River.". Card #4046, Published by M. Rieder, Los Angeles. Postmarked August 1913. In the private collection of Lyn Topinka.